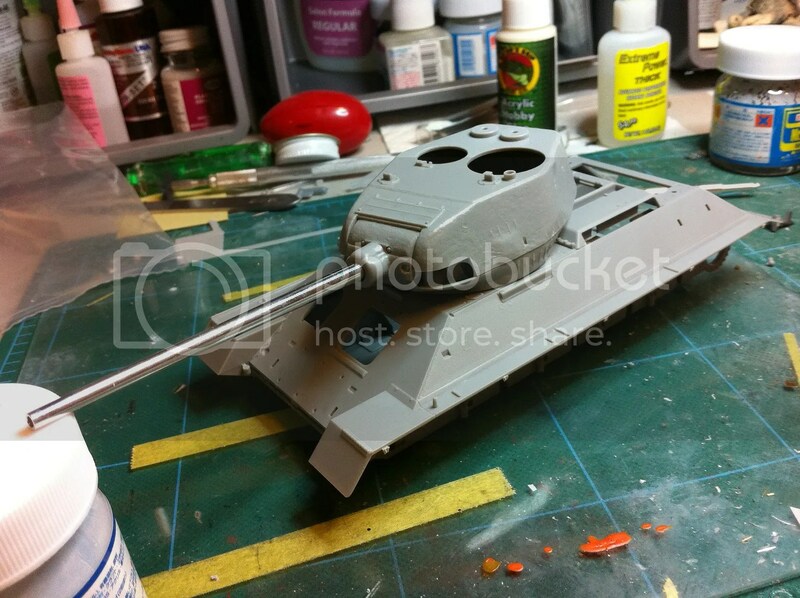 I’d originally planned to follow the KV-2 and Cyber-Hobby M4A4 buildups with Dragon’s excellent Tiger I Late Production…but got a short way in before realizing that it called for painting some internal elements within the construction process. With the bench packed up, that’s a no-go, so back in the box for the Tiger. 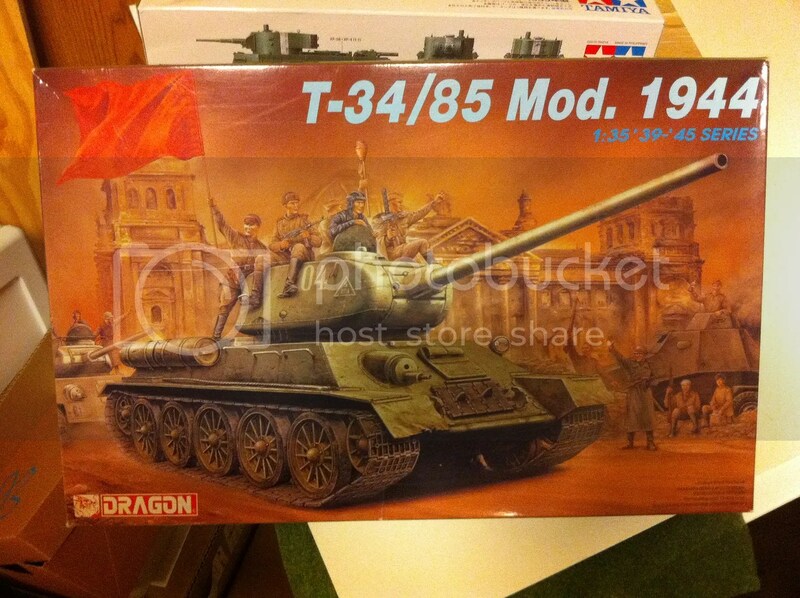 Instead, I’m cracking into another Dragon kit, this one acquired at the recent ASMS show – the Soviet T-34/85 Mod. 1944. The Soviet T-34 is one of the most-produced (if not the most produced) and successful tanks in the history of armored warfare, and a testament to the fearsome capability of Soviet industry. The T-34 was not a pretty tank. Nor did it boast the sophistication of its German opponents. Production simplicity was integral in its design, and yet it proved astonishingly tough and lethal. And it’s sloped armor influenced tank design for the rest of the war, specifically in the forms of the German Panther and King Tiger tanks. By the Battle of Kursk in 1943, however, German tanks were growing more potent, and the T-34’s 76mm gun faced a challenge from the new Panther and Tiger tanks. The solution, as always in World War II, was to add a bigger gun. In this case a whopping 85mm gun. The result? The T-34/85, which spearheaded the Soviet drive into the very heart of Nazi Berlin. The Dragon T-34/85 is not an easy kit to find. I’m not sure why that is. You can’t throw a rock without hitting a T-34/76 on sale somewhere. Since I only came back to modeling last year, I’m terrible about placing when different kits were produced, but the T-34/85 definitely seems to predate Dragon’s Panzer III and IV molds. Perhaps it predates a newer T-34/76 as well. Whatever the case…when I first thought “I’d like to try armor again”, I bought some Friul tracks for the T-34, not realizing at the time that they were different from the /76 to the /85. So for all this time I’ve had the tracks, but not the tank. Well, problem solved! They and an aluminum barrel given to me by a fellow FSM forum member are the sole aftermarket items going into this build. So…how’s the kit itself? Simple, compared to other Dragon kits I’ve encountered. The parts count is probably one third to one half that of the Cyber-Hobby Panzer III Ausf.L. The parts are mostly simpler and less fussy, too, though the T-34 is also a considerably less intricate tank at the same time. An initial test-fit shows that the main components fit together well, and seem to preview a quick and easy build. Stay tuned for the full build-up. And also be sure to keep checking back in the coming weeks. I don’t want to spoil the surprise, but I’m considering something quite cool to fill the time while the bench is out of commission. Let’s just say that you’ll maybe want to really try to be around toward the end of October and first part of November!